The Android 4.0 Ice Cream Sandwich is one mobile operating system update that many people are looking forward to, as not many devices offer Ice Cream Sandwich right out of the box. It seems that Samsung has just announced a Premium Suite upgrade that will head towards the Galaxy Note device – around the world, from Q2 onwards. This should be right in line for the Android 4.0 Ice Cream Sandwich operating system update as well. Just what does the Premium Suite offer in terms of benefits to Galaxy Note owners? Well, for starters, the software package will include additional multimedia features as well as a range of new S Pen optimized applications. We shall take a look at the Premium Suite in greater detail right after the jump. 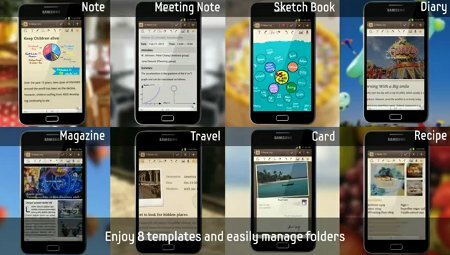 First of all, the Premium Suite will come with a bunch of new features and applications that are made exclusive to Galaxy Note as well as its innovative S Pen, which will include the S Note, a special kind of tool that allows you to combine your notes or sketches alongside other digital content. This enables you to create your own stories right there and then, and even those who lack a creative direction can always rely on the S Note which comes alongside a slew of ready-to-use templates. The S Note will also include the innovative Shape Match and Formula Match applications, where they are able to help correct and digitize geometric shapes, in addition to solving numeric formulas that were hand-drawn with S Pen. Talk about increasing your efficiency and productivity wherever you are! I myself would just write down mathematical formulas just to see that happen time after time again. Tables and grids can be drawn before they end up digitized instantly. Not only that, there is My Story, another S Pen optimized application which allows you to conjure your very own personalized digital cards for friends or family, where you can draw from various content such as notes, video content, photos, text or voice. Last but not least – all work and no play makes Jack a dull boy, which is why Angry Birds Space will offer feather flinging action right out of the box.